What a Pet Aqua Comb Does! 1. Deep hydro massages and calms the animal, making cleaning easier and more fun. 2. Their coat will be brighter and cleaner. It will have a luminescence look do to their hair roots being fully clean. Show dogs will have an unbelievable edge! 3. 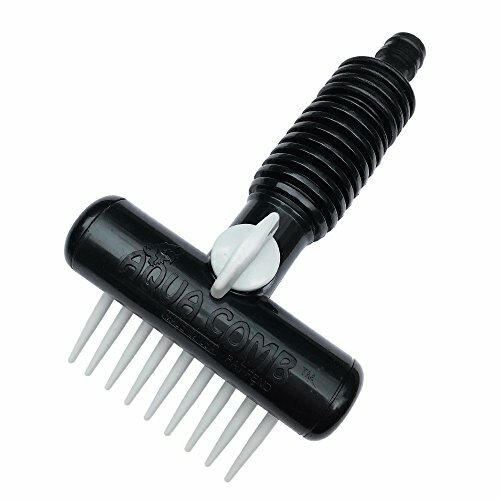 If you wash your pet weekly with the Aqua Comb, you will not have dead hair or doggy odor in your home! 4. Removes all soap residue and will help restore good healthy skin! Which Pet Aqua Comb is Right for You? For pets with short hair or short-medium hair length (think German Shepherds), the short comb (black) is the best choice. For pets that have medium to long hair length (think Border Collie and large cows), the long comb (grey) is the best choice. The short comb (black) is recommended for all horses and would also be the choice for young cows, pigs, llamas, donkeys, etc. (think 4-H kids). We believe the Pet Aqua Combs work best on medium to large dogs, however there are small dog owners who do enjoy using them. The Aqua Comb is designed to be attached to a standard ¾" garden hose. A step down fitting can be used to attach to smaller diameter hoses. FUN TO USE! Enjoy washing your pets while transforming their health and well-being! HIGH QUALITY! Made in the USA with durable, UV protected plastic with high quality control and no leaks! If you have any questions about this product by Aqua Comb, contact us by completing and submitting the form below. If you are looking for a specif part number, please include it with your message.